A resistor that changes resistance as a function of its temperature is also referred to as a thermistor. Thermistors increase their resistance when temperature increases, thus resulting in a Positive Temperature Coefficient. An NTC thermistor, meanwhile, decreases its resistance when temperature increases, resulting in a Negative Temperature Coefficient. When crafted with very pure semiconducting ceramic, PTC heating discs, fins, and honeycombs make ideal solutions for specialty applications. PTC heaters can quickly create enormous heat transfers in small spaces; in fact, these heaters can produce an instantaneous flow of heat that is 50% hotter than the flow created by more conventional oil or ceramic chip heaters. With the ability to perform in extremely small spaces with superior heat transfer and safe, powerful, and energy-efficient operation, PTC heaters offer several benefits across a wide range of industries. 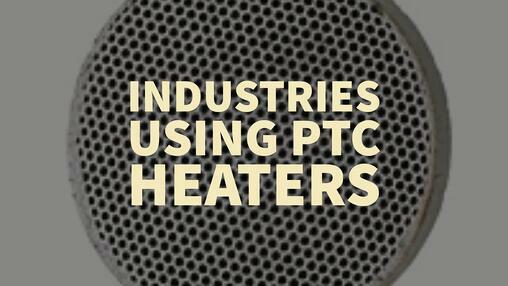 Versatile and compact, PTC heaters are especially useful in the food and beverage industry. Used for heating and temperature control in various appliances, including coffee hot plates, food warmers, and temperature-controlled containers, PTC heaters allow for consistency and reliability in a range of applications. With superior dehumidification and anti-condensation properties, PTC heaters are ideal for food safety, food processing, and other high-moisture manufacturing processes. As moisture problems take on increasing importance in plant environments and USDA and federal requirements grow stricter, processors are looking to PTC heating technology to reduce humidity and resulting bacteria growth on food machinery and equipment. Avoid issues encountered while using coil or conventional heaters including cracking or bursting. Established automotive heating methods, which utilize the internal combustion engine’s cooling system, can take significant time to heat an automobile’s interior. PTC auxiliary heaters effectively remedy this problem and are frequently used by leading automotive manufacturers worldwide. As a leading manufacturer of specialty heating solutions, axial AC and brushless DC fans and motors, as well as custom blower solutions, the Pelonis team is proud to offer top-of-the-line PTC products. Safe, efficient, and long-lasting, these versatile devices help save our customers time and money. The Pelonis team is committed to innovation in motion, heating, and cooling technology. To learn more about our unique products, exceptional quality, and competitive pricing, download the Pelonis catalog, or reach out to the team today.